EXTERNAL PROJECTS in collaboration with different institutions and structures in Oslo and elsewhere. For the second year, Human Scarecrows’ series of non-eventful moments will suggest performative rituals allowing a dialogue with the birds to prevent them from eating the seeds. Rather than chasing them away, we aim to engage a dialogue and distract them by any means: they will be the true spectators. All the performances and actions will be using alternative technologies as source of power and will be activated in between sunsets and sunrises. Human Scarecrows 2.0 is taking place everyday at 5pm at Flatbread Society from the 9th to the 16th of June. Human Scarecrows is uncurated by vandaler forening, commissioned by Flatbread Society and made possible with the great support of Kulturetaten, Futurefarmers and PNEK. During Åpent Forum, Petra Kuppers and Stephanie Heit will introduce the work of The Olimpias, an international disability culture collective. They will share insights from recent performance projects, including their current inquiry, The Asylum Project, which explores multiple meanings of “asylum:” from asylum seekers to psychiatric asylums, from queer sanctuary space to temporary places of security and refuge in public. They will also share insights from Salamander, a community performance project that uses underwater photography, performance workshops, creative writing, and video. Petra and Stephanie will also give tutorials to the students of the Art Academy (Kunstakademiet i Oslo). Greenpeace Volunteer Group Oslo and Vandaler Forening are proud to invite you to the screening of the documentary “Black Ice: The story of the Greenpeace Arctic 30” followed by a concert of SKÆVV (Harald Fetveit & Thomas Oxem). At this occasion, we will show several posters made during “Save the Arctic” campaign, which aimed to promote awerness around oil drilling and fish industries in the Arctic region. Over 2000 posters from all over the world have been received and 3 winners have been selected to join Greenpeace for their next adventures around Svalbard. SKÆVV is a rather noisy outfit consisting of of Thomas Oxem on drums and Harald Fetveit on analogue electronics. Thomas Oxem is known from the unpolished and ever adventurous rock band Bladed, while Harald Fetveit is one of the grandfathers of Norwegian Noise music. He has collaborated with a.o. Mattin, Lucio Capece, Anla Courtis, Taku Unami, Seijiro Murayama, Hong Chulki, Lene Grenager, John Hegre, Agnes Hvizdalek and Baktruppen. Through Dans for Voksne – a series of concert that started in 2003 – he has organised projects in Svalbard and Finnmark. Greenpeace has been campaigning against environmental degradation since 1971 when a small boat of volunteers and journalists sailed into Amchitka, an area north of Alaska where the US Government was conducting underground nuclear tests. This tradition of ‘bearing witness’ in a non-violent manner continues today, and their ships are an important part of all their campaign work. The event is fully supported by Greenpeace Norway. Thanks to the whole team for making this happening! Seeds will be sowed the 21st by all the core members – Oslo Apiary, Growlab, Food Studio, Hage Crew, Emmanuel Rang, Jørund Aase Falkenberg, Herbanists and Zoe Christensen – according to the scheme of Bootes’ constellation, including each core member into a circle or «star». Bootes is a constellation made up of twelve stars and is also known as the Shepherd. Nine of the stars will be hosted at Losæter and three will be located at host farms outside of Oslo. Human Scarecrows will be present in Losæter, marking the transitional space in between each of the star. The core members will sow edible flowers and plants, to create a durational urban garden, open to all the neighborhood and visitors. After the sowing process, the birds threaten the site as they might eat the seeds. This is where Human Scarecrows’ series of non-eventful moments will suggest performative rituals allowing a dialogue with the birds to prevent them from eating the seeds. Rather than chasing them away, we aim to engage a dialogue and distract them by any means: they will be the true spectators. Via Radio Ramona (created by the artist and art producer Marthe Van Dessel), Paolo Gaìba Riva will air sound recordings made from the birds’ perspective, which will also function a subjective documentation of the whole event. Fernanda Branco will open the ceremony, joining the core members in an abstract choreography around the actions of sowing-sewing. 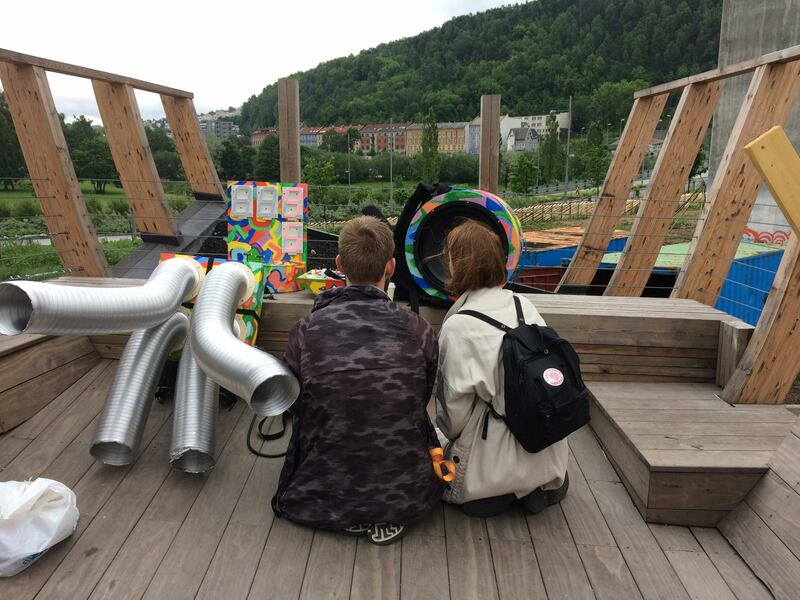 As the ritual takes shape and following the restrictions of using alternative technologies, the noise musician Nora Fiona Eriksen will Play the Sun, a semi- composed piece using different electronics. By using the sun as a power source, her electronics will mark the contrasts of this brutal force of nature. How gently is allows to harvest it’s energy. As the battery runs out, it will be a reminder of our own mortality. Seemingly working around the idea of the loss of power or energy, the experimental project feilkontroll will join Human Scarecrows by composing a piece responding to birds’ emergency calls. The four members – Ole-Peter Arneberg, Torbjørn P. Larssen, Torunn Avelsgaard Lien and Hanan Benammar – will repeat their piece until complete exhaustion of their bodies. Helped by a hand-made structure, Aksel Høgenhaug will attempt to stretch the conversation with the birds by spreading an online bird-song archive with portable speaker, activated by wind energy. If the wind blows hard enough, the sound will be spread continuously. If not, he will have to run around the site for several hours a day. Experimental sound production being at the very core of the program, bolwerK by Marthe Van Dessel will perform with her hand-made instruments at the start of Human Scarecrows while Mattias Cantzler will end the program, installing Mariusstrømpeblues, a hand-made 3 tones busker organ which will previously be shown during Oslo Utmark outdoor exhibition. Ellmer Stefan & Agnes Hvizdalek’s contribution will take ornithological material such as books, videos, recordings as a starting point for an interplay of mutual mimesis. The birds as a concrete natural threat will be confronted with and demystified by various modes of cultural representation in form of scientific illustration and description, bird-song transcriptions and recitation. By displaying (visual, textual, acoustic) our human assumptions the high degree of misunderstanding between man and bird, the semantic and logic asynchronicity will leave this absurd attempt of imitation with only one conclusion: the infinite unintelligibility of «the other». As much as poetry is rooted in both musical and textual formats, Ragnhild Aamås will perform a monologue as an anthem to our flying fellows. During the performative improvised poetry club Flight Club, Maria Belic will respond to the sowing site by showing the birds their compliant transactions, engaging with time as a main medium. Pushing the format of durational performance, Agnieszka Golaszewska will undertake an ongoing site-specific film set The Streamer from the Background Noise where she will be filming for seven days an improvised movie with the help of guest actors. She will engage live performance, sound and projection on the towers. All these spontaneous actions on site will be thus amplify the building process of Into the Ground and up to (into) the Sky. Human Scarecrows is uncurated by vandaler forening, commissioned by Flatbread Society and made possible by the great support of Futurefarmers, Bjørvika Utvikling and PNEK.